There are two main methods of communicating external equipment, either they are mapped into the physical memory and given a real address on the address bus (memory mapped I/O) or they are mapped into a special area of input/output memory (isolated I/O). Figure 15.1 shows the two methods. Devices mapped into memory are accessed by reading or writing to the physical address. 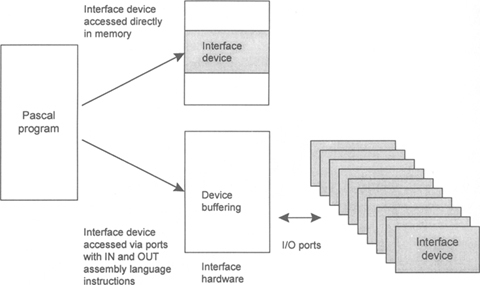 Isolated I/O provides ports which are gateways between the interface device and the processor. They are isolated from the system using a buffering system and are accessed by four machine code instructions. The IN instruction inputs a byte, or a word, and the OUT instruction outputs a byte, or a word. 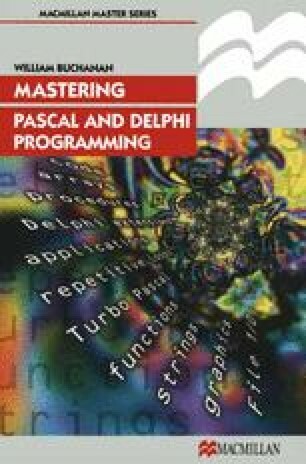 A Pascal compiler interprets the equivalent high-level functions and produces machine code which uses these instructions.